Class fee: $240 + tax, includes all printing materials and one large paper (divided in quarters.) Additional paper may be purchased. This workshop provides an exciting opportunity to create beautiful limited edition prints using positive and negative plates, and multiple color plates. Utilizing Photoshop and printmaking you can turn an ordinary color photograph into an “out of this world” image. Gravure was introduced in the 1800’s as a way to reproduce photographic prints and is still used today. Prior knowledge of etching, photography and/or Photoshop is very helpful but not necessary. This class is open to all, but it is recommended that students take the “Introduction to Gravure” class first. Class fee: $ 240 + tax, includes two small plates, and all printing materials. Additional plates are available for purchase. Class fee: $245 + tax, includes all printing materials and one large paper (divided in quarters.) Additional paper may be purchased. 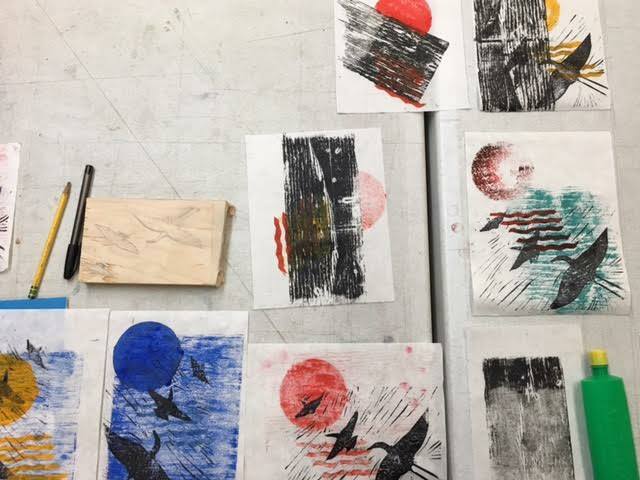 In this innovative workshop, you’ll learn how to use digital images or drawings on polyester film to create a carborundum collagraph. This vastly expands the creative possibilities for carborundum printmaking, in which plates are normally created by painting with acrylic medium and adding carborundum grit. This technique uses a light-sensitive film adhered to screenprinting mesh (often referred to as “EZ film”). This film is exposed to a positive transparency in a light exposure unit, and any unexposed film is washed out with water. To make the plate, Akua’s Carborundum Gel is pushed through the holes in the exposed mesh onto clear acrylic. Plates are inked up with Akua Intaglio or other suitable ink, and printed on an etching press on dampened paper. Your instructor, Trish Meyer, is an experimental artist, printmaker and calligrapher with a background in graphic design. Visit her website at trishmeyer.com. This is a special chance to work with guest teacher Lihie Talmor. Talmor is an Israeli artist who divides her time between Israel and Venezuela and has shown her bold, thought-provoking work throughout the world. This comprehensive two-day workshop, open to artists of all experience levels, will explore how a printed image can shift from the photographic to the graphic mode and what can be gained from their combination. By working with two plates—the first etched from the projection of a photograph and the second made through traditional etching techniques, we will create a composite image that brings together photography’s power to record and etching’s power to invent. Participants should bring a digital file of a photographic image with which they wish to work. Knowledge of copper-plate etching techniques is useful, but not necessary. Through an intensive exploration of inks and ink modifiers, this workshop offers the context, information, and inspiration to create richly layered monotypes and monoprints, both as singles and in series using soy-based Akua inks. This workshop will focus on exploiting the possibilities of viscosity techniques to yield results that cannot be achieved any other way. Taking advantage of ink interactions and developing multi-color prints from layering inks on a single plate. It will cover many approaches, both traditional and experimental, including: trace transfer, reductive, additive, and viscosity monotype on a variety of matrices. We will explore resists as stencils and add dimension through relief blocks, stamps, texture tools and stencils. No toxic fumes and extended workability of the inks make it a liberating experience. Artists new to printmaking and Akua Inks, as well as experienced printmakers are welcome. Extensive notes on printmaking topics and techniques will be available for a small additional cost. Catherine Kernan is a nationally known printmaker specializing in the use of the non-toxic Akua Inks. New Grounds was one of the first completely non-toxic professional print workshops in the world. In business for more than 20 years, it is an internationally recognized institution dedicated to providing artists with press access, classes, exhibition opportunities and other printmaking related services. Did you know we have art studios for rent?